Plot: Our hero is intelligent, skinny, friendless Miles, who chooses to finish his final two years of high school at Culver Creek, a selective boarding school in Alabama. Miles is definitely in for an education: Not only are his classes more challenging than he ever could have imagined, but he is embraced by a group of new friends unlike anyone he’s ever known before. Miles’s awkwardness slowly dissipates as he finds his place in this tight-knit group, made up of his roommate Chip “the Colonel” Martin, exotic and innocently alluring international student Lara, gifted hip-hop freestyle artist Takumi, and mysterious Alaska. Alaska is the most intriguing girl Miles has ever encountered. She is beautiful, witty, worldly, charismatic, and deeply unhappy. She is moody and unpredictable, but also more fun than anyone Miles has ever known. Then the unthinkable happens, and Miles and his friends lean on each other as they struggle to make sense of their lives in its wake. Our take: Within the first few pages, Miles quotes writer Francois Rabelais’s last words, “I go to seek a Great Perhaps,” to explain his decision to attend boarding school to his parents. This makes it clear from the start that Miles isn’t your average teenager. Or is he? As the book unfolds, young readers will find that while Miles is certainly smart and has some unusual hobbies (he loves to read biographies and memorize the last words of famous people, for example), he’s still a pretty typical kid. He’s embarrassed by his body, overthinks most social situations, and is desperate for a girlfriend. And, like many teenagers, his lack of self-awareness is blended with self-absorption in a way that makes the world feel confusing at times. Miles is able, with the help of his friends and a lot of introspection, to find a measure of peace by the end of the book. Some of his wounds are still raw, but he’s found a way to begin healing himself, and his journey will be especially valuable to kids who have experienced the sting of loss. We particularly love the way Miles’s friendship with the Colonel is developed; while many YA books explore the depth of female friendships, too few portray the range of emotions present in relationships between adolescent boys. This haunting book will captivate almost any teenager. Adult themes: The teenagers in this book all smoke, swear, and experiment with alcohol. The book contains some sexually explicit material, as well. 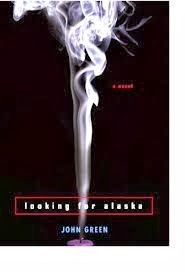 Concerned parents should read it first, but keep in mind that we’d never recommend anything we thought was inappropriate, and many schools around the country have added Looking for Alaska to their ELA curricula.